China and El Salvador established diplomatic relations on Tuesday after the Central American country severed "diplomatic ties" with Taiwan. State Councilor and Foreign Minister Wang Yi and Salvadoran Foreign Minister Carlos Castaneda signed the joint communique on the establishment of diplomatic ties in Beijing. The establishment of diplomatic ties based on the one-China principle conforms to the universal consensus of the international community and the trend of the times, Vice-President Wang Qishan said at a meeting with the visiting Salvadoran delegation, including Castaneda. Both sides should strengthen exchanges, deepen mutual trust and advance mutually beneficial cooperation, opening up a new chapter for bilateral ties, he said. El Salvador become the fifth country to break "diplomatic relations" with Taiwan since Tsai Ing-wen of the pro-independence Democratic Progressive Party became the leader of the island in May 2016. Only 17 countries still have "diplomatic relations" with Taiwan. Speaking at a joint news conference with Castaneda after signing the joint communique, Wang Yi hailed El Salvador as "a new friend in Latin America and the Caribbean region" and "a new partner in promoting the Belt and Road Initiative and building a community of shared future for mankind". China will work with El Salvador to achieve common development, enhance partnerships between China and the whole of Latin America, and make contributions to the collective rejuvenation of developing countries, he said. Castaneda said his country remains committed to the one-China principle and will no longer have official relations or official contacts with Taiwan. Salvadoran President Salvador Sanchez Ceren said in an address earlier on national television that "we are convinced that this is a step in the right direction, which corresponds to the principles of international law, international relations and the inevitable trends of our times". El Salvador is the most densely populated country in Central America and also the location of the secretariat of the Central American Integration System. Foreign Ministry spokesman Lu Kang said at a regular news conference on Tuesday that the establishment of diplomatic ties with China is a political decision made by El Salvador without any economic preconditions attached. Taiwan Affairs Office of the State Council spokesman Ma Xiaoguang said on Tuesday that Taiwan authorities are urged to refrain from taking any action that undermines the well-being of Taiwan compatriots and to return to the "1992 Consensus" as soon as possible, as going against the trend of the times is futile. Any attempt to create "two Chinas" or "one China, one Taiwan" will lead nowhere and will also be opposed by all Chinese people, Ma said. Su Xiaohui, an international strategy researcher at the China Institute of International Studies, said in an interview with China Daily that it has been repeatedly demonstrated that the one-China principle is in accordance with the overwhelming consensus of the international community. 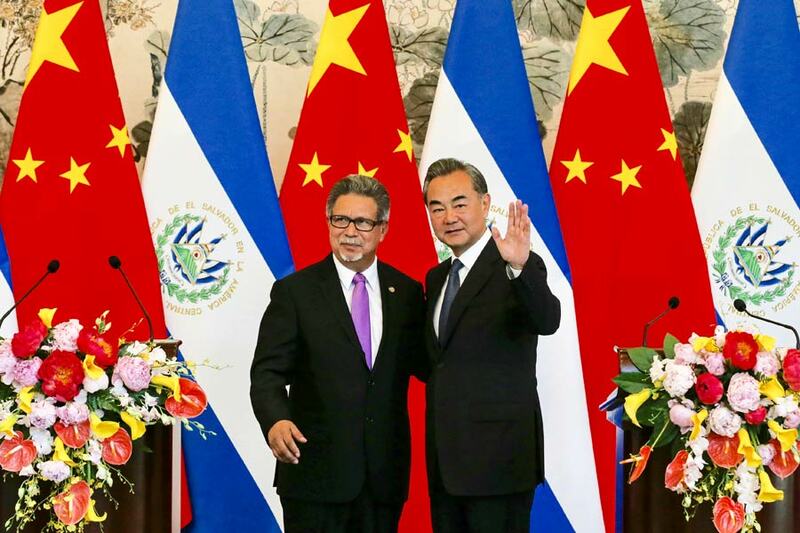 The establishment of diplomatic relations between China and El Salvador, which took place shortly after Taiwan leader Tsai Ing-wen's trip to Paraguay and Belize, deals a heavy blow to pro-independence forces in Taiwan, she added.